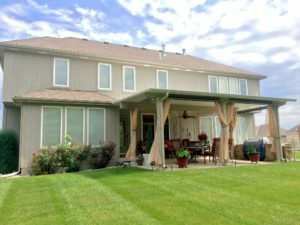 Premium patio covers can enhance the beauty and functionality of backyard areas, helping homeowners better enjoy their Lincoln, Illinois, properties. This is especially the case with the patio roofs offered by the experts at AAA Window – Siding Roofing. We sell top-of-the-line patio covers from the outdoor living experts TEMO. These home upgrades are visually stunning and feature columns that pay homage to stunning Italian architecture. Furthermore, these products are incredibly durable and resistant to peeling, cracking, rusting, and rotting. That’s not all, though. When you invest in a patio cover from AAA Window – Siding Roofing, you can expect to receive a patio cover that is virtually maintenance free. You’ll only need to occasionally wipe it down with soapy water and cloth for a like-new appearance. We can not only provide you with a stellar patio cover, but also with professional installation services. Our skilled team will make certain your backyard upgrade is installed properly and promptly so that you and your loved ones can begin enjoying your new shaded space as quickly as possible. And, you can feel confident that your installation is in the hands of experienced professionals, as we have more than 30 years of experience in the industry and have earned a number of accolades throughout our time in business, such as being named to Qualified Remodeler magazine’s Top 500 remodelers list. Are you ready to get one step closer to enjoying a shaded retreat at your Lincoln, IL, home? If so, contact AAA Window – Siding Roofing today. When you do, one of our experienced associates will be happy to answer any questions you might have about the impressive patio covers we install.